With the restructuring of the tech giant Google, did we just witness the magical recipe of Berkshire Hathaway being applied in the tech industry as well? Such corporate announcements form great case studies and provide good fodder for thought experiments to evaluate the decision from various perspectives. Here are some of my thoughts on the announcement. So what do Charlie and I find so attractive about Berkshire’s conglomerate structure? To put the case simply: If the conglomerate form is used judiciously, it is an ideal structure for maximizing long-term capital growth. One of the heralded virtues of capitalism is that it efficiently allocates funds. The argument is that markets will direct investment to promising businesses and deny it to those destined to wither. That is true: With all its excesses, market-driven allocation of capital is usually far superior to any alternative. At Berkshire, we can – without incurring taxes or much in the way of other costs – move huge sums from businesses that have limited opportunities for incremental investment to other sectors with greater promise. Moreover, we are free of historical biases created by lifelong association with a given industry and are not subject to pressures from colleagues having a vested interest in maintaining the status quo. That’s important: If horses had controlled investment decisions, there would have been no auto industry. Ease of capital allocation and autonomous focus are key benefits of conglomerate structures. As you can see in the blog by Larry Page, similar objectives are mentioned in the announcement of the new company. 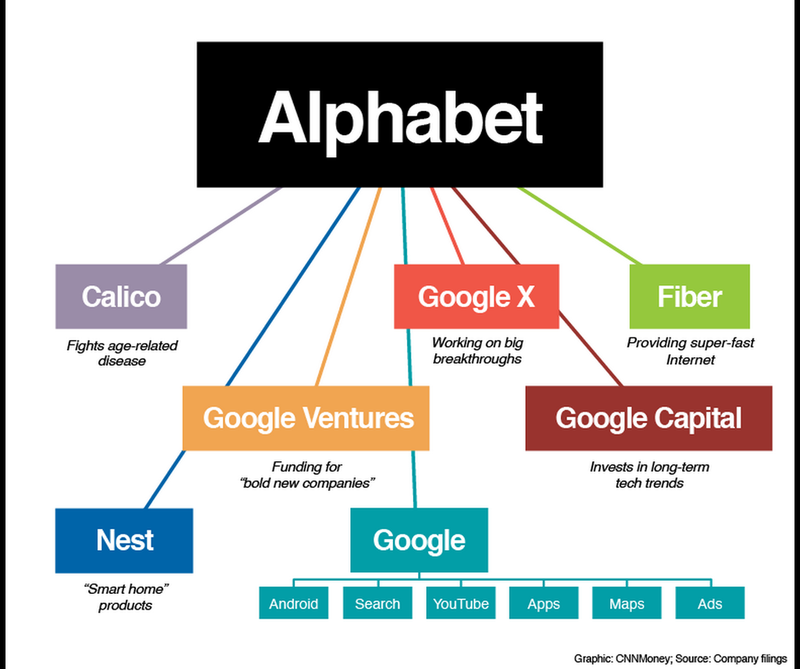 Alphabet is about businesses prospering through strong leaders and independence. In general, our model is to have a strong CEO who runs each business, with Sergey and me in service to them as needed. We will rigorously handle capital allocation and work to make sure each business is executing well. Capitalism makes r>g and this probably helps Alphabet Inc. In reading Thomas Piketty’s Capital in the Twenty-First Century, learnt that in capitalism, the return on capital (r) is always greater than return on labor (g). A dollar invested in capital delivers higher return than the same dollar invested in labor / activity. That is the reason why we see companies like Amazon, Facebook, Twitter etc. have exponentially far more market capitalization value than the book value of its business operations. This equation might help Alphabet Inc. if it gets adept at the game of capital allocation. As we saw today, just the announcement of this new structure increased the market capital value of Google by 6.2% (approximately $27B). The hope of the investors is that by focusing on judicious capital allocation, the promoters will be able to more easily buy and sell franchises / businesses that in the long run generates higher returns. This also creates an opportunity to buy good businesses with existing moats vs. continuing to grow moats organically the way Google used to do earlier. Imagine, this new structures will have many more CEO, CFO and COO positions and that definitely attracts top talent. It’s the people / leaders that are key to any success (and also failures) of businesses and at that C level, it’s not only the money but attractive title and autonomy to make decisions that attracts visionaries and motivated leaders. This in turn creates very high probability of creating successful ventures. Warren Buffet always extols the accomplishment of his management team in every letter to his shareholders and in many interviews mentions he over-trusts his management to do their jobs well. He says – “The joy of hitting business “home runs” means as much to them as their paycheck”. Investing in people and giving them autonomy creates huge economic value. Google so far has been financially very successful only in its search business. All the other franchises it holds such as android, google maps, youtube, gmail, etc. are just customer acquisition tools for its search business. In tangible terms many of the experiments Google was conducting so far have not resulted in any major breakthrough in financial terms for the company. Just changing the form / structure may not change the underlying realties of the industry in which Google operates. As they say timing is everything for technology adoption and Google is betting that its time has come to elevate the company to the next level. This is how the new structure of the company looks like.